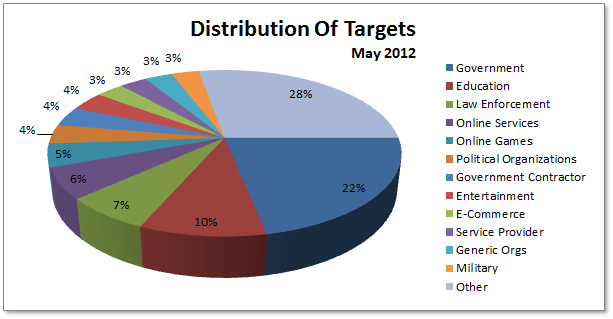 As usual, here we are with some fresh charts obtained from the first part of the June 2012 Cyber Attacks Timeline. 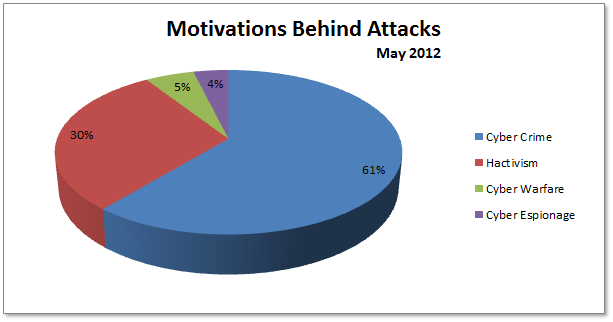 Let us start with the Motivations Behind Attacks chart. Once again Cyber Crime Ranks at number 1, showing a growing trend respect May, from the 61% to 82% (at least in this first half). On the other hand, hacktivism-led cyber events have dropped from 30% to 14%. Apparently no explicit Cyber Warfare event has been detected, at least according to the data I collected. ith this new classification, Government targets go down at rank number 2 with the 15% of occurrences (against the 22% of the previous month), followed by targets belonging to education with the 10% (the same value collected on May). Interesting to notice is the apparent lack of attention by cybercrookers against Law Enforcement targets. In any case, if we consider the fact that Industry data have been aggregated, the chart is not so much different from the one of May: Governements keep on showing a worrying lack of Security. 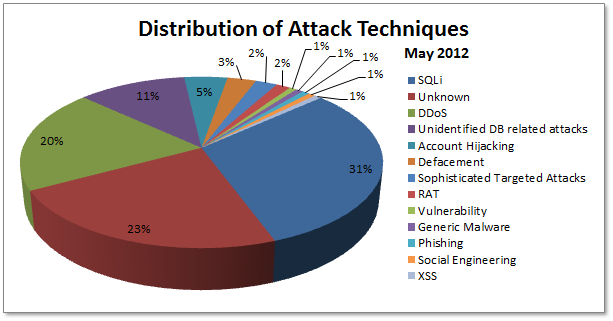 Last but not least, during the first half of June, it has apparently been difficult to identify the 40% of the attack techniques, although, SQLi (and more in general DB vulnerabilities) keeps on to hold the crown among the identified events. Interesting to notice the drop of DDoS attacks (from 20% of the sample to 10%). Probably it is not a coincidence that it has followed the same trend than the hacktivism-driven Cyber Attacks, having halved its rate with respect to the previous month. Again, no need to repeat that data must be taken very carefully since they do refers only to discovered attacks (the so-called tip of the iceberg), and hence do not pretend to be exhaustive but only aim to provide an high level overview of the “cyber landscape” of the month. Furthermore, if you want to have an idea of how fragile our data are inside the cyberspace, have a look at the timelines of the main Cyber Attacks in 2011 and 2012 (regularly updated), and follow @paulsparrows on Twitter for the latest updates.